I seem to have entered my blue period the last couple of weeks. I have just moved from one hat to another on the same three balls of wool (Patons Classic Wool worsted, as usual), replacing them as they run out, making sure that if I change balls, I do it where it is unlikely to show any potential dye lot change. I am becoming increasingly unhappy with the limited colour palatte that I have available at the place I buy this yarn. I may be in the market for another brand of wool soon if things don’t pick up. 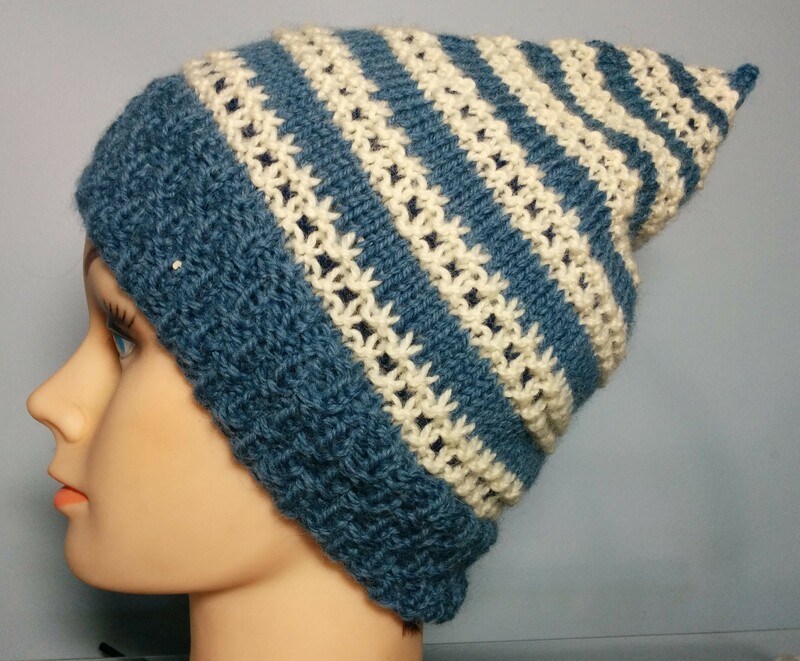 I think I will stick with worsted weight for the hats though..any suggestions? I hate fashion,.. my kind of colours are only “in” once in a while and I have to wade through times where I don’t “get”or “feel” the current colours. Now seems to be one of those times. Give me back my pure hues, please, these shades are killing me! Ok, here we go. Heather, aka my harsh little critic, was pretty scathing about the concept of this first hat. When I explained what I was going to do I got “don’t worry, this one will stay in the freezer forever because no one will ever want it”. When I was photographing them today, she actually put it on…something she rarely does any more and actually came close to admitting it wasn’t terrible…it accommodated her high ponytail completely. She did say she liked the pattern, which is Stripe and Spot pattern, pg 56 above Basket Rib, pg 17. I completely did not understand these next two colour change patterns when I read the instructions. The 50 year old black and white photography does not do them justice in the book. 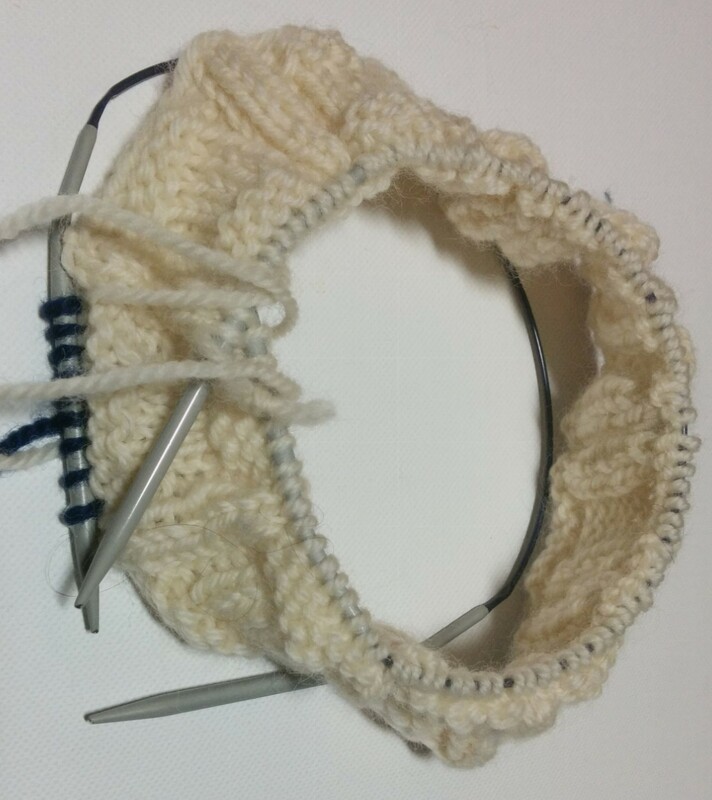 I charted them out just to make sure before I started knitting, something I rarely do any more. 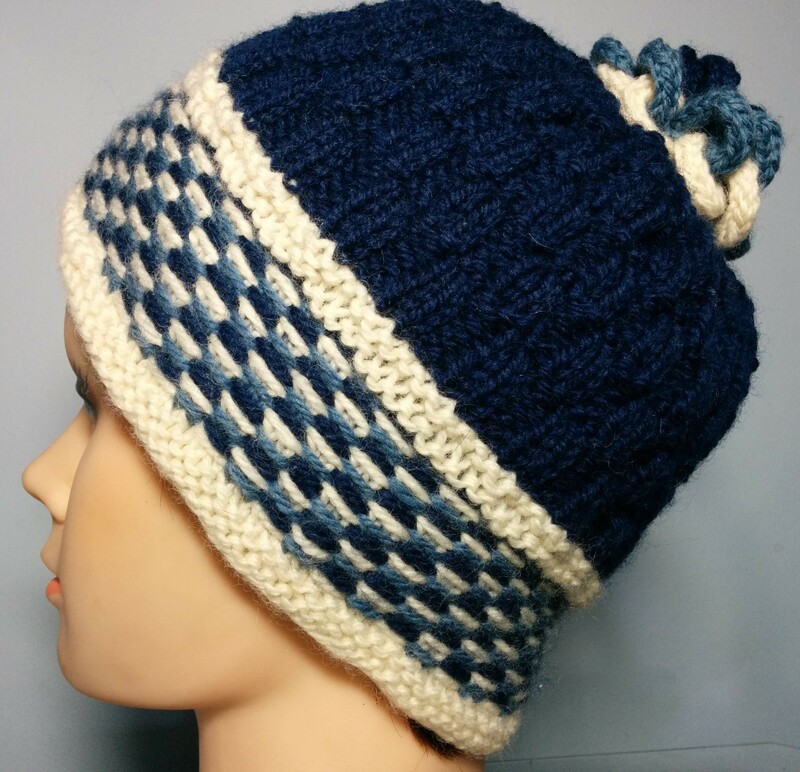 For the first one, I used Tricolor Fabric Stitch, pg 56, I also used Basket Welt, pg 17 at the bottom of the hat and Double Basket Pattern, pg 18 at the top of the hat. 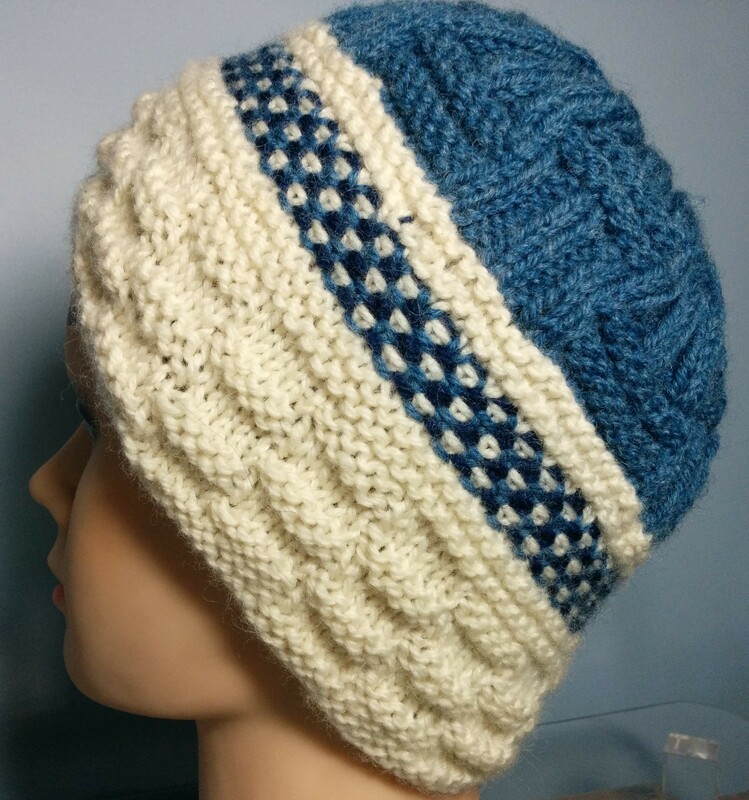 The next hat, I used 4 garter stitch rows at the bottom of the hat then did the Double Tricolor Fabric Stitch, pg 57. I put four more rows of garter stitch, then Elongated Rib Check, pg 18. I was unhappy with the way the decreasing looked at the top so I put one of my I-cord roses on the top (for instructions, click here). still unhappy, and in an i-cord kind of mood from the last hat, I added an i-cord rope at the bottom edge, then I did four garter stitch rows on the other needle to continue up the hat and firnished off with Swedish Check, pg 20. 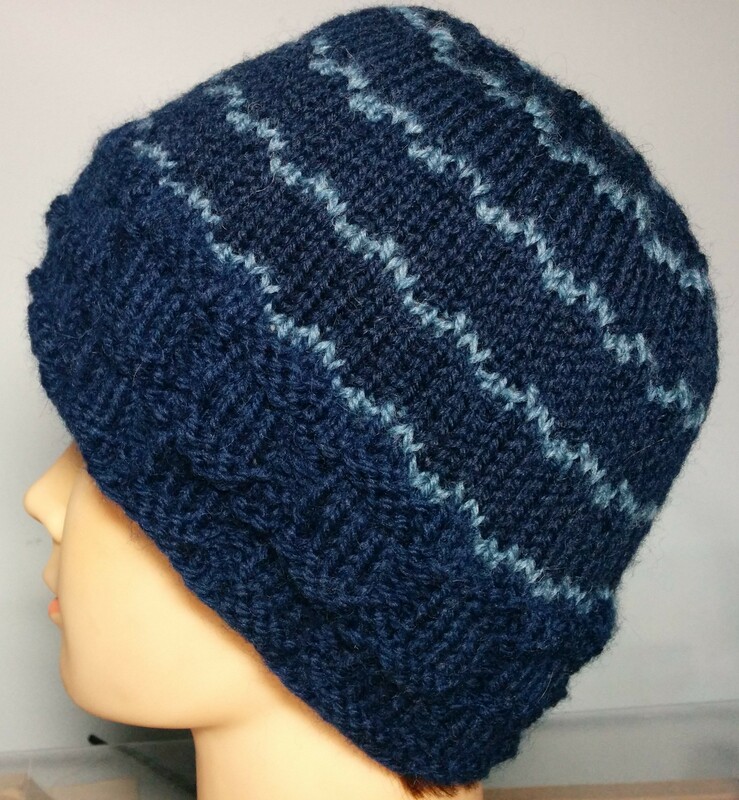 My last hat is a pretty simple one with Swedish Block Pattern, pg 19 below Ripple Stripes, pg 55. Just to round things out, I did another baby sweater, using Tamerna Stitch, pg 115 for the ribbing, and Mrs Hunters Pattern, pg 150. I also used Horseshoe Cable, pg 243 on the front. I must say, I am still finding this project endlessly fascinating and I think the stuff I am making isn’t terrible. 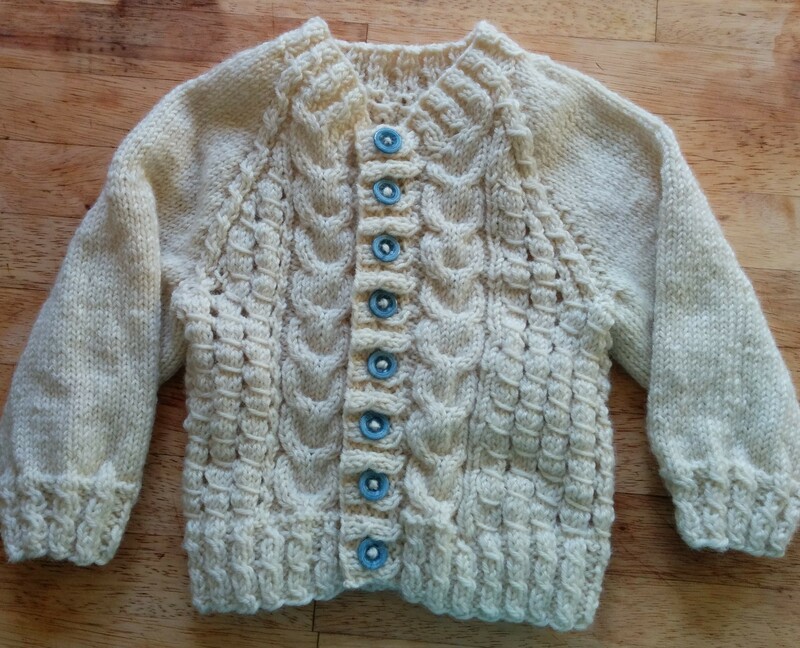 This entry was posted in Barbara Walker and tagged Barbara Walker, Patons Classic Wool on June 20, 2015 by gillianknitter. I love the dbl tricolor fabric stitch. Your hats look great Gillian…don’t be so hard on yourself. 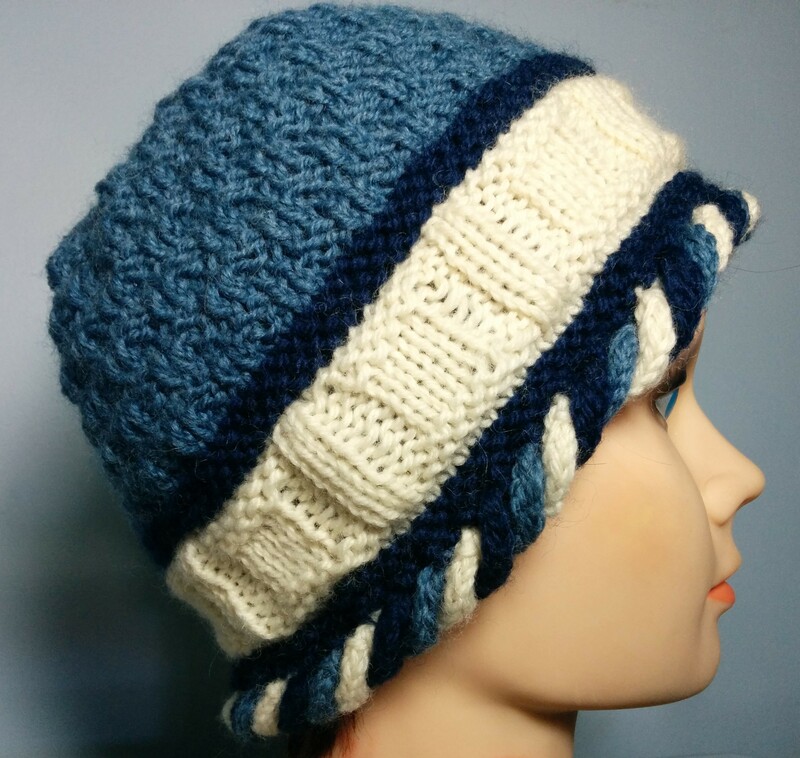 The long pointy one can be worn flipped (bent) to one side as the “carnaval” toques are worn.